This morning I sent my youngest son to his first day of first grade. He’s a smart boy, usually pretty well-behaved (or so I hear from other people), friendly, and very funny. I know that he will do well with school this year. But for some reason he is incredibly nervous about this venture into first grade. The poor kid ate very little breakfast and wouldn’t say much. When I asked him what he wanted to wear for his big day, he thought for a while and then chose a camouflage tee-shirt because he wanted to be able to hide if he got scared. I gave him a hug and told him he would be a great first-grader. Then I told myself he would be fine. And I told my husband (apparently several times) that our little guy would be just fine. I have to hand it to the brave little man. When it came time to go, he looked slightly panicked, but he shouldered his big blue backpack and went willingly into the building. I found myself whispering, “Here we go” and, once again, “he’ll be fine.” I started thinking back over this summer’s many adventures and smiled to realize that these were almost the same words I had whispered to him as I sat next to him on his first roller coaster ride. In 1850, at the tender age of twelve, LaMarcus Adna Thompson successfully built his own butter churn and ox cart. But believe it or not, this was not the height of his mechanical prowess. After a time, young Thompson grew up (as all young men must), apprenticed as a carpenter, and designed a machine used for the production of ladies’ stockings. He soon founded the Eagle Knitting Company in Elkhart, Indiana. Alas, as the well informed (which no doubt means you) will likely already realize, the ladies’ stocking industry is incredibly stressful and really is no place for a young man destined for greatness. For the sake of his health, Thompson took some time away from his growing company for a doctor-prescribed trip west. He then apparently disregarded his doctor’s advice (or he was not a particularly competent map-reader) and found himself in Pennsylvania where he observed the Mauch Chunk, Summit Hill and Switchback Railroad. 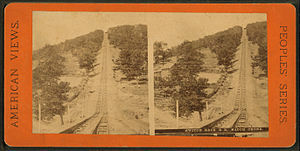 The railroad was a clever way to cart coal from Summit Hill to the Lehigh River at Mauch Chunk (today that’s Jim Thorpe, Pennsylvania). What Thompson saw was a cart full of coal and a couple of bewildered mules, rushing on a track through a series of switchbacks down the mountainside as fast as gravity would carry it. At the bottom, the cart was unloaded so that mules could haul it the long way back uphill. And an idea began to form in the inventor’s mind. Perhaps he thought about the mules (likely more stubborn than stupid) that willingly took the carts back up the mountainside to repeat the process. Or maybe he observed them carefully as they flew downhill and noticed that though they screamed they also threw their hooves in the air and smiled as though someone might snap their picture on the hairpin switchback turns. Mind you Thompson doesn’t have a great claim to the title. Russians started slipping down huge ice slides as early as the seventeenth century and the French built the first wheeled coaster by 1817. 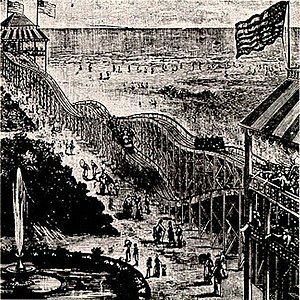 Still, Thompson can take credit for the first successful introduction of the roller coaster to the United States, where it’s been soaring to higher, faster, and “upside-down-er” heights ever since. And I, for one, am grateful for his contribution. I experienced my first roller coaster as soon as I was tall enough to pass the safety precautions and once I started, I never looked back. On more than one occasion I have arrived at the entrance of an amusement park in time to be among the first through the gate for the sole purpose of running to the back of the park and riding the best coaster two or three times before the rest of the crowd caught up and the line got long. I have also been the kid who chose to ride the coaster back-to-back-to-back many times over as the park neared the close of the day and no one else was left in line to take my place. So I was thrilled to take my two sons to Six Flags this summer and introduce them to the rides that defined many of the summer days of my youth. My eight-year-old is tall for his age and would qualify to ride any coasters he cared to try. My six-year-old, though too short for some, seemed determined to conquer any rides that frightened him. It turned out that they weren’t as brave as I had hoped. I did get my older son on a few rides, with mixed reviews (for some reason the feeling of his heart thumping in his ears and his stomach turning somersaults doesn’t especially appeal to him). My six-year-old took a long time to get up his nerve, but he surprised me in the end, choosing to ride one of the smaller wooden rollercoasters, one with a large hill and a dark tunnel. I admit I was concerned that he didn’t know what he was getting himself into. Still, once he had decided to give it a try, I doubt he could have been dissuaded (smart as he is, he is easily more stubborn than a mule). As the lap bar lowered, I held him close and whispered, “We’ll be fine.” And as the train began to roll, “Here we go!” He did conquer his fear and though I don’t think he would say that he loved the ride, he is pretty sure he will try it again someday. I just hope he feels the same way about first grade. Thanks, Steve. I miss you guys, too. I hope the first day went well! He had a great day and was anxious to go back for day 2. No need for camo! Thanks for liking my blog this morning. I love what you have written here, and definitely plan to read a lot more! Great blog! Thanks! I am the author of a novel that no one yet knows they want to publish. I am always interested to read about marketing successes. Congrats on yours! I love meeting new writers and watching their journeys. Have you thought about self-publishing? For me, it was really the only logical choice, but I know not everyone is as interested in it as I am. I loved having full control over every decision about my book. Ah, the power! Good luck, whichever way you go! I have thought about it quite a bit, largely because I do like the idea of having total control over my project. The idea of total self-promotion, however, has me quaking in my boots, even though I realize most authors, regardless of how they publish, are doing the vast majority of their own promotion anyway. My other concern is that it really is a dream to see my novel on library shelves (of course making millions and writing the screenplay to the blockbuster would be nice, too, but I would settle for library shelves) and right now there just isn’t a good avenue to get indie published books there. Uggh. There’s a lot to consider. Thank you for the good luck wishes. I will need it. And good luck to you, too! Self-marketing is just about how much work you want to put into getting the word out, and there are some really good books out there giving you ideas for ways you can do just that. Having a nice blog following is a start. There’s a built-in possible audience right there. Having friends with blogs and Facebook pages is yet another way to use social media to your advantage. Having a presence on GoodReads is huge, too. I think the trade off is worth it. You never know just how much marketing a traditional publisher is willing to do for a new author anyway. At least with self-publishing, it’s up to you, and you aren’t waiting and hoping for them to act on your behalf. Not knocking trad pub, here. Just thinking about the ways in which self-publishing work better, and be more in your own hands. Of course, every writer has different goals. Mine are shaped by the fact that I’m OLD!! 🙂 At nearly 70, I don’t have decades in which to hone my craft and find a publishing house that likes my work. I have to get good fast! The clock is ticking. So, of course, this was a big factor in my decision-making process. But from what I hear, it is getting harder and harder to find traditional ways to get your work out, so while you’re making up your mind, that’s one more thing to throw into the pot. I’ll be really interested in seeing what you do, and how it works for you. And I hope whatever it is, it leads you to great success. Thompson’s face reminds me of Daniel Craig(this has nothing to do with history of roller coaster but I just could not help but say 🙂 ). It has much to do with history. I like reading about the past in a light tone, just how you do it. You encouraged me to find out more about Mr. Thompson. Could you imagine his first ride cost 5 cents and there is someone in the sporting world with the same first and last night. Now I will try to remember What you taught me today. I’m delighted that you could learn something from my blog. I learn a ton while writing it and there’s always a lot that I just can’t squeeze in if I’m going to keep it light (which I very much want to do). That anything that I have written has ever inspired anyone to do their own research is more awesome than I can say. Thank you very much for your comments.